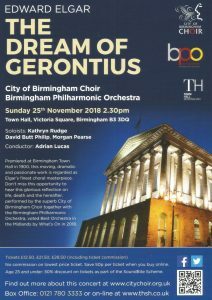 Sunday afternoon presents a wonderful opportunity to hear Elgar’s masterpiece The Dream of Gerontius at Birmingham Town Hall. Starting at 2.30 pm, this chance to be bathed in choral and orchestral sound should not be missed! Premiered in this hall in 1900, it is a glorious reflection on life, death and the hereafter. 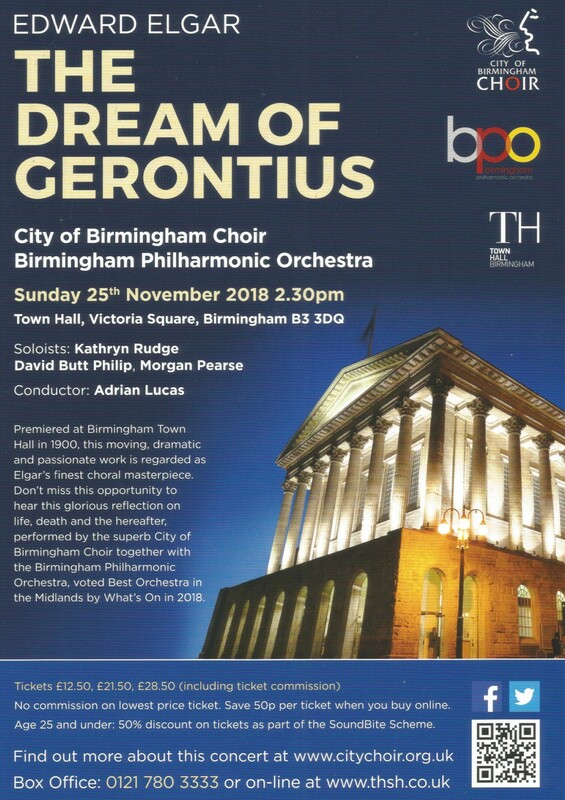 The ‘inspired’ City of Birmingham Choir and the excellent Birmingham Philharmonic Orchestra will be directed as usual by our conductor, Adrian Lucas. We have engaged a team of fine singers for the solo roles. Buy tickets online or on the door at Town Hall. You can also buy tickets for our fabulous forthcoming performance of Handel’s Messiah – an annual highlight in Symphony Hall. This entry was posted by Mark Lawrence	on Saturday, 24th November 2018, and is filed under News.